Rolling back odometer on a Series III? (not me). So I've been shopping around a while for an SIII. I've been waiting for one owner to send me photos of his car. He said yesterday he would take a bunch and text them to me. He sent about 20 photos this morning and the car looks very good. About 5 minutes after I received the photos, I asked him (via text message) to let me know the mileage, as it wasn't listed in his ad and I couldn't recall what he said in our previous conversation. I also asked him for some closeups of the windshield corners. He responds 10 minutes later with a text photo of the odometer as well as the close ups of the windshield corners. I'm looking through the first 20 photos and one of them also captures the odometer from a distance, but it CLEARLY shows about 37K more miles than the close up shot of the odometer that he sent to me. 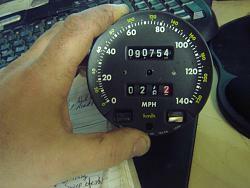 How easily can the odometers be rolled back and how quickly? I haven't called him on it yet, but wow. Rolling them back isn't easy at all... I've had lots of them out of the car and disassembled, but have never managed to put one back together after taking all the little gears out... I'd say it would be fairly difficult.. I know that it can be done... Places like Hollywood Speedometer can refurbish them and set the mileage. PHONE THE GUY AND DISCUSS.. I've done it and it's easy. I "rolled" my '76 XJ6c to Zero when I installed a SBC 406 and refurbished the whole car. I simply wanted to know the milage with out doing calulations so I set the odo back to 000000. I put series 3 guages and dash in my series 2 BTW. See picts attached to this post.... I just did it again right now to a series 3 unit I had on my desk. It took about 10 minutes to knock off about 81,000. You simply force the rollers, they click in to place. It's also common to find low mileage unit on ebay and then drop it in place. 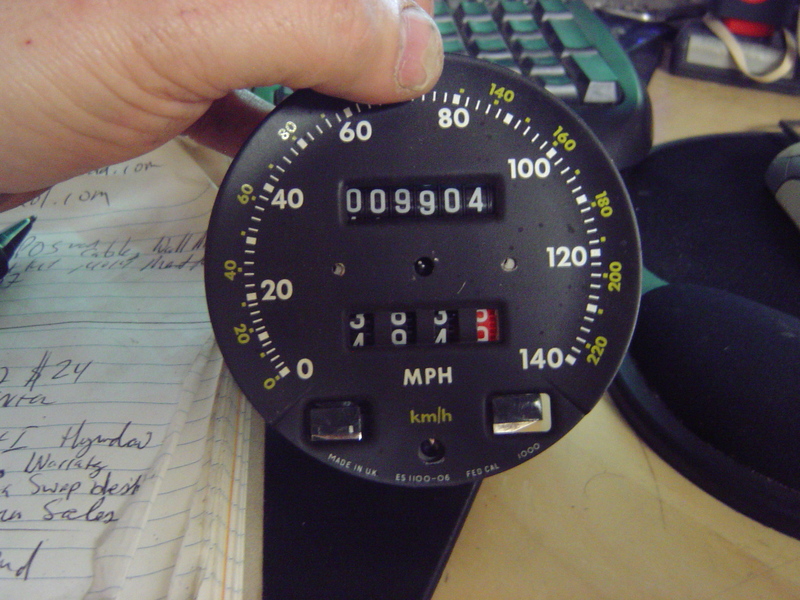 It take about 2 minuts flat to swap out a complete series 3 speedometer for another unit. You can get clues about a vehicle's mileage other ways....check the pedals for wear, check carpets, seat bolsters, door jams, door hinges, sill plates, service records. If a car has no documented service history it value is greatly diminished. I've done it and it's easy.. Totally agree. I have three series III speedometers on my bench right now that show zero mileage. I took them out of cars I have scaped for one reason or other and have rolled them back. How do you get speedometer opened? My odometer and trip odometer quit working but my speedometer still works. I pulled it out of the dash but don't know how to open it to get to the gears. Would oiling them fix the problem? Thanks in advance. Sorry I can't advise on fixing your inoperative odometer, but I thought I would provide an update since I began the thread. The seller admitted rolling back the odometer and commented on how easy it is to do. His rational was that he had swapped a transmission into the car with less mileage. Never mind the engine and the rest of the car I guess! The silly thing is that the before and after figures were both well over 100K, so it wasn't as if my assessed value of the car would have changed that much. Just thought I would provide that update. Quick Reply: Rolling back odometer on a Series III? (not me).